When working on any pattern, whether it be a book or a single, there's always a lot that goes on behind the scenes. When we were planning the Twisted Woolly Toppers blog tour, I felt it was important to get some of those involved in the process to share their experiences - Just Call Me Ruby and BabyLongLegs were kind enough to offer up their thoughts and tell you a little about their involvement, and Handmade Homeschool also contributed to the tour. Once a new pattern gets past the idea stage and into sample mode, and once I know the pattern works and has been graded into a number of sizes, said pattern then goes of to my fantastic test knitters. Once they're happy with it, it then goes off for tech editing. If you hang out at any of the designer groups or forums, public or private, you'll hear lots on the merits of tech editing and/or test knitting, and how it helps us as designers and our reputations and so on. Rarely though do you hear those people speak about what the process is like for them, so I asked some of my lovely test knitters if they had something they wanted to say. So, here they are in their own words! I enjoy being a Woolly Wormhead test knitter for a lot of reasons… first and foremost, I love her designs, and it's fun to get a "sneak peek" at the newest patterns. The other knitters on the team are great, and I enjoy the spirit of collaboration. Everyone is supportive and helpful. Woolly's designs sometimes challenge me, which makes me stretch and grow as a knitter. Sometimes the patterns are an easy, quick knit, which is rewarding as well. Most of all, I appreciate the opportunity to be able to contribute in a small way and help someone whose skills I admire. I do test knitting and sample knitting for several well-known designers. I think my background as a proofreader and my desire to learn new things fueled my interest in test/sample knitting. I like having the opportunity to knit garments that I otherwise wouldn’t get to knit. 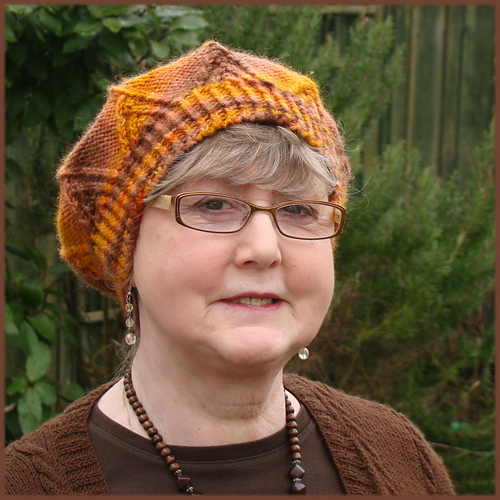 A couple years ago, I had been knitting dozens of chemo Hats when I saw Woolly Wormhead’s post asking for test knitters. I thought I’d like to try knitting different styles of Hats for a change, so I answered her request. The first patterns I test knitted for Woolly were from her Wee Woolly Toppers collection in the summer of 2008. It was so much fun, I stayed with it and continued test knitting her Hats including ones for her most recent collection, Twisted Woolly Toppers. When I do test knitting for Woolly Wormhead, I don’t knit the Hat with plans of making it and giving it to a specific person. I do it because it gives me the chance to try out new and different patterns and techniques that I wouldn’t ordinarily try and I can always donate the Hats to charities. In the past, I have donated Woolly’s Hats to hospitals, the homeless, and to the “afghans for Afghans” program, so that helps satisfy my desire to knit for charities. It seems to be a good situation for everyone involved. I discovered WW's designs in November 2008 when I knitted Dylan's Beanie in response to her request for someone to knit and photograph this Hat. Since then I have knitted 44 of WW's patterns (some of them several times). I have certainly improved my skills and understanding of Hat knitting during this time. I found that the patterns were simple to follow, and even complex designs seemed easy when following her clearly written instructions. I soon became addicted and when Woolly asked me to join her team of test knitters, I was only too pleased to be involved. It's a good feeling to be one of the first to see and knit a new design and I like the discipline of reading the patterns to check for accuracy and the discussions with the designer. I tested four of the designs for Twisted Woolly Toppers and loved each one of them. The finished book of 10 patterns, complemented by some beautiful photographs taken in Italy, is a 'must have' for knitters of all skill levels and won't break the bank! I enjoy test knitting for Woolly Wormhead for several reasons. I enjoy proofreading and the "working out process" as well as trying to see the pattern through the eyes of the "typical" knitter. And naturally there is quite a bit of a thrill in getting my hands on a pattern before the general public gets to see it! Woolly's Hats keep with current style but they are not copies of what everyone else is doing. Her writing style is fabulous and she really tries to ensure that even the first time hat knitter will be able to understand the pattern. I love the testing group we have for WW. Being able to talk through a sticky portion of a problem with both the designer and other testers helps me grow as a knitter and it builds a sense of camaraderie that just isn't found in many group situations in my experience. The way ideas and suggestions flow between all of us is special and Woolly always takes the time to consider our suggestions. Thank you ladies, not only for your contribution to this post but also for being part of the test knitting team - your work and feedback and commitment and support is simply amazing.